Having been contacted for this project I had the luck of seing it from start to where it is now, regarding it’s design side. At first the only thing I had to work with was that it was ment to be a concept that would inspire people to turn to culture as a substitute for all the media madness around. The project evolved as a crusader for righteousness, promoting all things culture related – be they political, social or otherwise interesting. Exploring related ideas: Trying out different objects and symbols. With the project manager I shared enough meetings to try and come up with a concept that would stick (! ), something that people would easily remember involuntary, something that goes both with the intended path of the project as with that which it promotes. The idea was that culture is at a turning point in our society and the best way for it to be absorbed by the masses would be in small doses (cups, if you will). 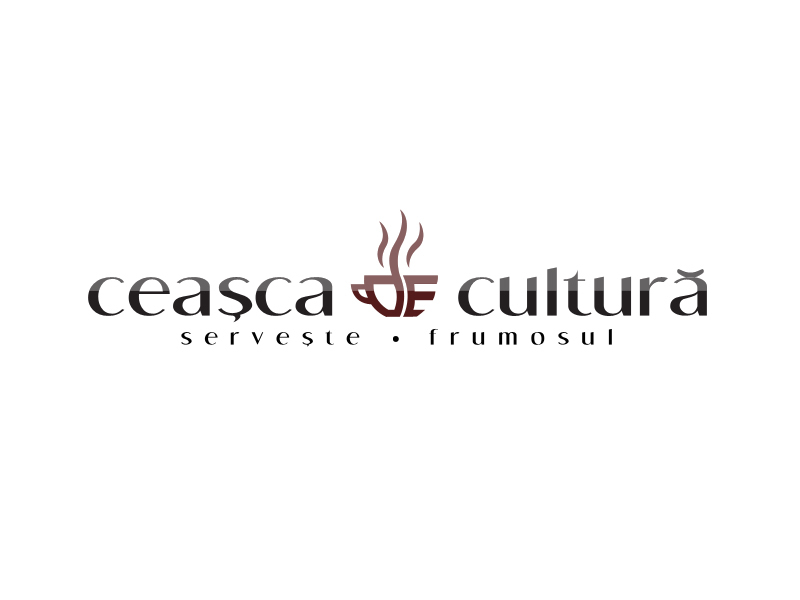 Everyone deserves a daily cup of culture, thus the name Ceasca de Cultura (Cup of Culture). The right path: FInd a good concept to work with and improve. Finding an idea which to follow was not easy as it had to be simple, yet effective. I doodled a lot of papers before coming remotely close to something decent. The point was that culture should be the center of it all and regarding the logotype, all of it should be contained within a small center-placed cup. After some talk with Mircea, the project manager, he said I should try and explore this idea but remained open towards other ideas from my part. As I got it stuck in my thick skull, it wasn’t easy to let go of it, so I tried it out on digital support with a couple of mottos for tests. The end result wasn’t as expected but it came close. Digital experiments: Trying the idea digitally. The fact is that it wasn’t an identity all that well held together, looking like something that’s trying to hard to be something it’s not, so: back to the drawing board. The central idea had to remain the same but with better integration and symbolism. 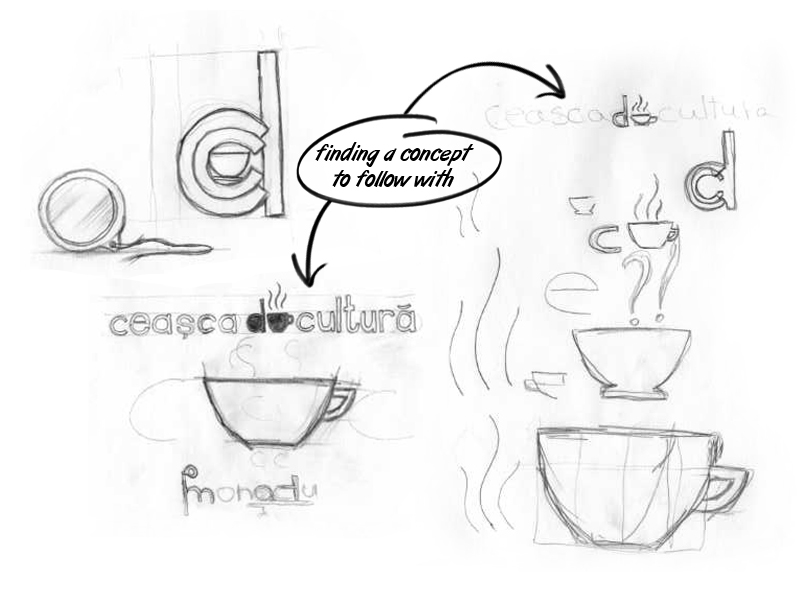 The cup (“ceasca”) and the culture (“cultura”) had to flow together well and bind in the form of this project. 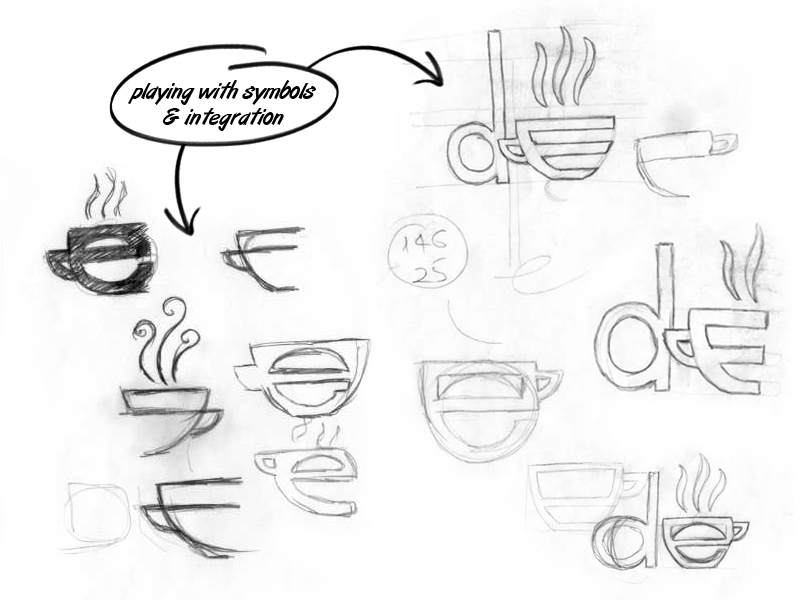 Iconography: Variations on the coffee cup icon integration. 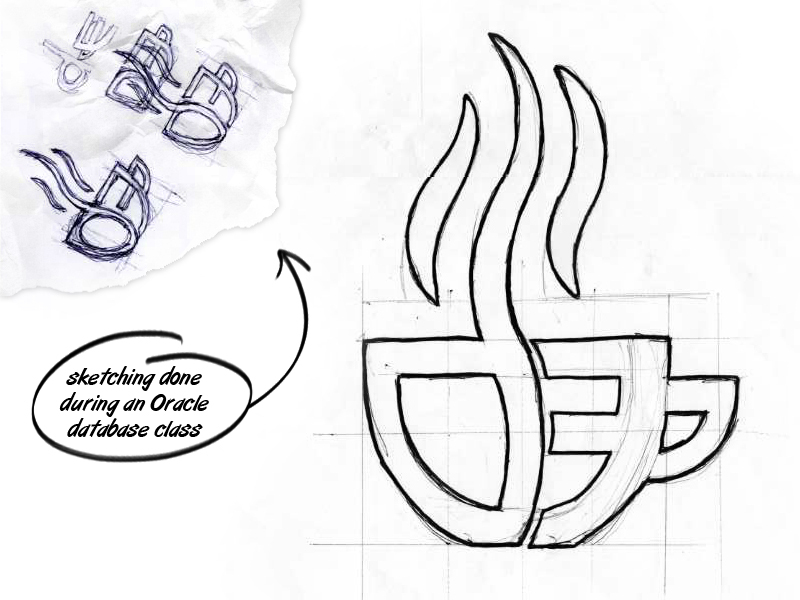 During a class about Oracle databases my mind wandered a little bit and I started doodling on my course papers. I wasn’t going for anything in particular, only trying to fiddle around with the arrangement of this logo. 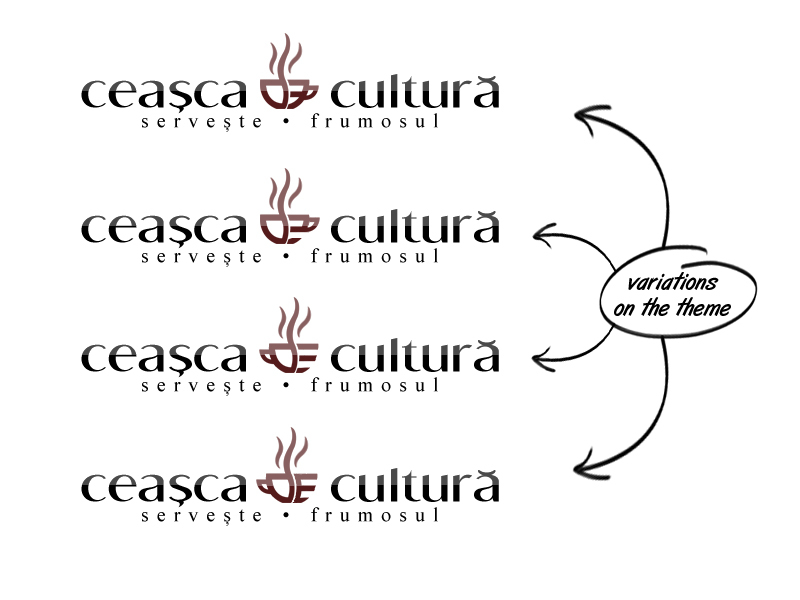 Little did I know that the image of this scribble which I sent to Mircea would define the Ceasca de Cultura brand. The d-e combination was better: it had more flow, more unicity, it cmobined the two words better and was able to bring forward a symbol for the project. Surprise inspiration: Getting the right idea during an Oracle database class. I later redrew that concept in a larger format – a little too large in fact, I had to tape together two sheets of paper because of bad initial scaling. Having the general path in my head and the doodles in front, the new integration was easier to acomplish and it turned out very nice. Tidying things up: Retracing the icon and improving the lines. What followed was choosing of the appropriate color scheme. It had to be simple, stylish and with a hint of class. After that was settled the process went to varying the d-e couple to see which combination worked best when it came to harmony, readability, unity etc. Final choice: Different layouts for the icon, to observe best results. Having picked the right one for the job, the final logotype creation was achieved and I could move on the next steps in putting this brand in motion. The final version was slightly refinned and I could move on to creating the scalable (vector) version of it. 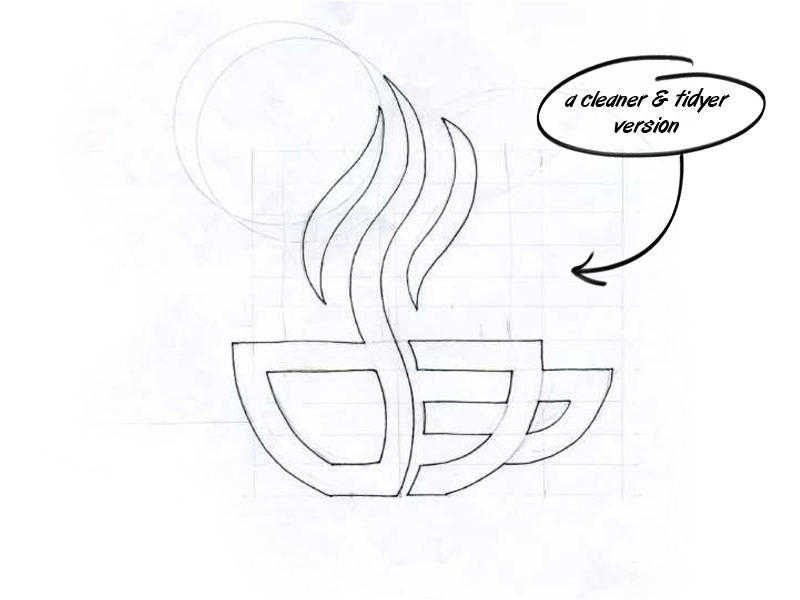 The result: A logo that embodies the spirit of the organization. 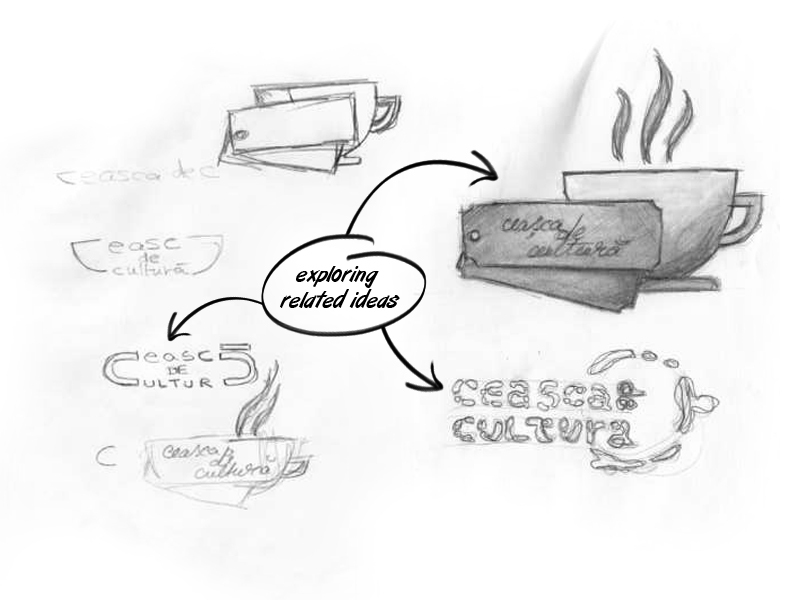 The “Ceasca de Cultura” project was one of the most enjoyable projects for me regarding design. It had very good team management, the goals were clear and despite later interventions along the way, it turned out into that which it was ment to be: the place were you go to for a cup of coffee, a croissant and of course… a daily dose of culture.